When should I select a VELUX awning blind? The VELUX awning blind is an external blind perfectly suited to stop strong sunlight and heat even before it hits the pane on your roof window. While not in use, the awning blind is discretely hidden in a top cover. When extended to the base of the sash, the semi-transparent fabric cuts out the direct rays of the sun and effectively reducing the heat in your room - still allowing visibility to the outside. The blind can also be used when the window is open. Awning blinds are therefore ideal for rooms where you want effective heat protection, view and daylight at the same time. The manually operated VELUX awning blind with hooks can either be fully rolled down or up. To operate the awning simply open the window and rotate it 180 degrees. Then attach or detach the awning to the hooks on the ouside of the bottom sash. When closing the window, the awning will then automatically roll out or up. Once you have rolled the awning up or down, you can of course open and close the window as you please. Well suited for roof windows within reach. 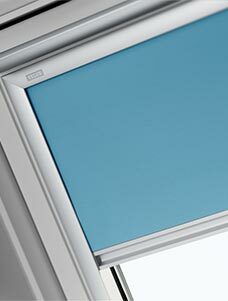 This VELUX awning blind is remote controlled and electrically operated. The blind has stepless positioning and is perfect for roof windows that are out of reach. It can be controlled from anywhere in the room by the remote control originally supplied with your electrically operated VELUX INTEGRA® roof window. 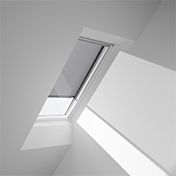 If you don't have an electrically operated VELUX roof window, but would like to have an electrically operated blind, simply add a KUX 110 to your order. The blind can be installed from the inside as well as the outside. Warning! Please note that professional electrician might be required to install this product (KUX 110). This VELUX awning blind is remote controlled and powered by an energy-saving solar-charged battery which is good for up to 600 operations even if there is no sun for recharging. Installation is wireless and can be done from the inside as well as outside. The blind allows you to enjoy all the features of the io-homecontrol® functionality, e.g. to program the blind to open and close at specific hours. If you have a solar powered INTEGRA® roof window, you can also use the remote control originally supplied with the window. 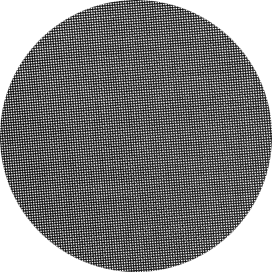 Well suited for windows that are out of reach.